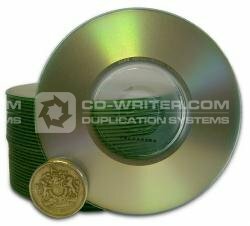 Mini CDR Media is just three inches in diameter yet holds either 208 Megabytes of data or 21 minutes of music. It is designed to fit in the recessed area on the tray of a CD Recorder or player. Since a CD is recorded from the inside out, a CD Recorder or player can use this 3-inch media without a problem. Mini CDR disks are ideal where shirt-pocket size is desired. It is recorded or played just as a full-sized disk is; it just holds less data or music. Our 3-inch media is also compatible with Sony's MVC-CD1000 Mavica digital camera. 8CM . CDR . with . vinyl . wallet . Pack . of . 100 . Unbranded .